It’s Time D-Heads! 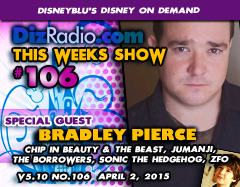 This week we celebrate Easter with colored eggs, parades, music and memorable movies as we welcome BRADLEY PIERCE (Chip in Beauty and the Beast, Jumanji, The Borrowers, Sonic the Hedgehog, Little Mermaid TV Show, ZFO Entertainment, Kipper the Dog) to the show! Bradley stops in and discusses Cartoons, voicing Chip in Beauty and the Beast, working with Robin Williams in Jumanji, Sonic and his newest venture in ZFO and more! And to help the Easter Celebration continue we have the D-Team here as you have questions and Erin has answers in I Want To Know. Nathan takes a trip to the past with This Week In Disney History and Caitlin returns with the latest from the Walt Disney World Resort in WDW-In-2. Paige is coming at you with another review in The Magical Music Review and Randy is back at it in Disney Multi-Media. There is news hot off the D-Wire with news about the parks, new merchandise, live action movies, animated movies, books, star wars and much more!